“Man overboard!” But it was on purpose! Throw Jonah over the side of the ship to save the ship! Jesus is the Greater Jonah who is swallowed up by death but rises again the third day. Come hear about the “sign of Jonah” this weekend as we celebrate the Fourth Sunday after the Epiphany. 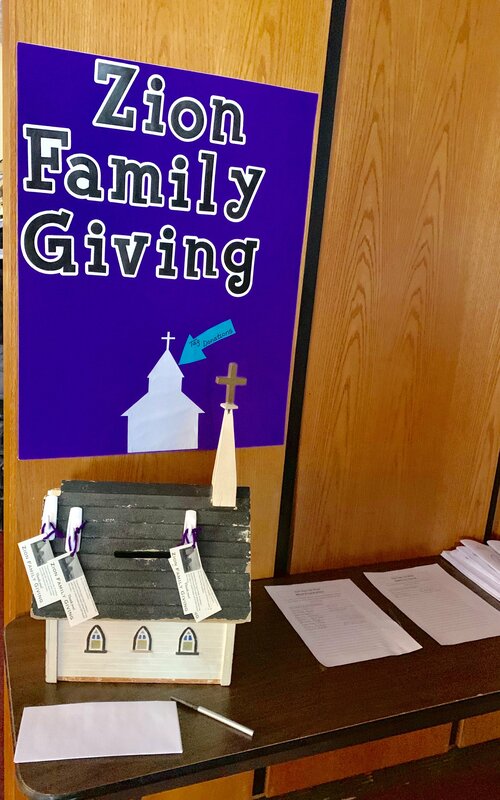 We’ve got our Zion Family Giving station set up in the narthex (right next to the Guest Book). Please stop by and see if there are ways you might be able to help a fellow member in need. We have tags on the little church of needs that you might be able to help with. If you haven’t signed up to provide meals or give rides and would be willing to do so, those signup sheets are on the same table. Let’s work together to care for one another in the Body of Christ! This Wednesday is the First Wednesday of February. That means a Zion Family Meal at 6pm. Join us and then stay for Evening Prayer with Holy Communion to follow. Our school’s Early Enrollment starts this week. It’s an opportunity for current school families to enroll and reserve their spot. On February 11, Open Enrollment begins. We’ll be offering Full and Half-Day programs for 3 year olds through First Grade next year. If you know someone who would be interested for their children, let us know and we can get them some information. Jesus’ Word stopped the wind and waves. His Word stops the raging of sin and death against you. Come hear His Word and receive His calm and peace. We’ll see you in the Divine Service this weekend!